A hula hoop on fire is one of the most fascinating fire modalities. This tool allows the dancer to not only spin fire around the waist, but from each point along the entire body. 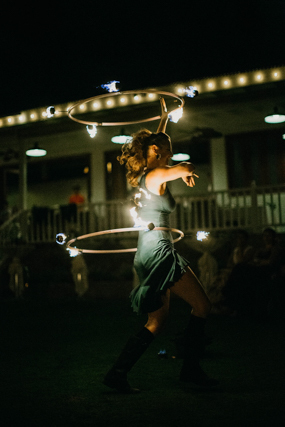 This creates for an unlimited amount of action when performing tricks, moves, or illusions with a hula-hoop on fire. As hula hooping has become an international sensation, so has fire hooping in the fire dance community. The combination of hula hooping and the beauty that it entails with the excitement of fire added creates magic unlike anything else. This magic has brought the hearts and minds of many talented individuals and groups together to explode into the entertainment scene. If one hula hoop on fire wasn’t enough, dancers will spin with 2 or 3 hoops on fire at one time. This takes an incredible amount of focus, concentration, coordination and safety precaution. However, much like a circus performer, fire hoopers dedicate hours, days, weeks and years to perfect this challenging skill. 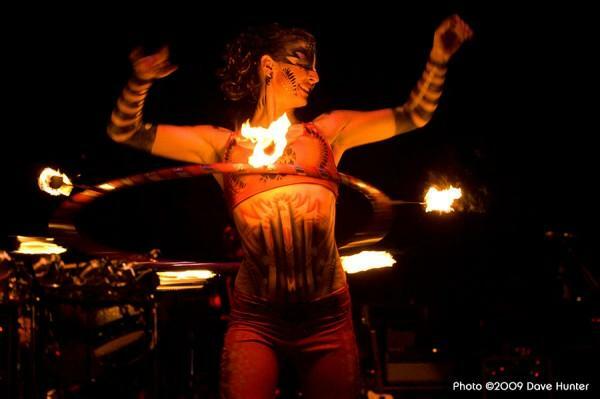 Our dancers pride themselves on dancing with single and double hula hoops on fire, for a spectacular performance. Witnessing this beautiful art for truly allows the audience to engage in this striking display of talent; as though a ring of fire moves effortlessly around the dancers body. It is almost an illusion to watch as the hoop revolves around and around the body, never to contact the dancers body with the fire. The fire simply leaves tracers of light around the entire body allowing the dancer to be illuminated by this convergence. This flow of dance, style, trickery and beauty leaves an impactful observation. Watching a hula hoop on fire is always an audience favorite, as there is nothing else quite like it. This crowd stopping presentation is a must-see if you have never before.